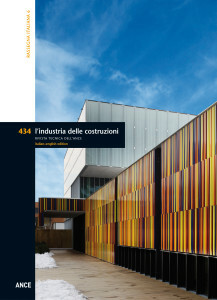 The architectural journal L’Industria delle costruzioni is published six times each year as a 5-colour offset print on 130-gram opaque art paper, format 21 x 29 cm. Each monographic issue is dedicated to a specific theme. Issues consist in a critical essay and an accurate selection of works of contemporary architecture. All texts are accompanied by ample and detailed drawings, photographs and technical descriptions that ensure a complete and exhaustive understanding of current architectural research. Monographic themes are accompanied by additional columns exploring various issues, current events, innovative materials and technologies and a section dedicated to book reviews.